Even though this Pentecost icon deals with an extraordinarily exciting event, it radiates sheer tranquility. Not a tongue of fire, rush of wind or perplexed crowd to be seen. This makes clear that the icon is not trying to give a historically accurate account of what took place, but rather wants to illuminate the meaning of Pentecost, then and now. 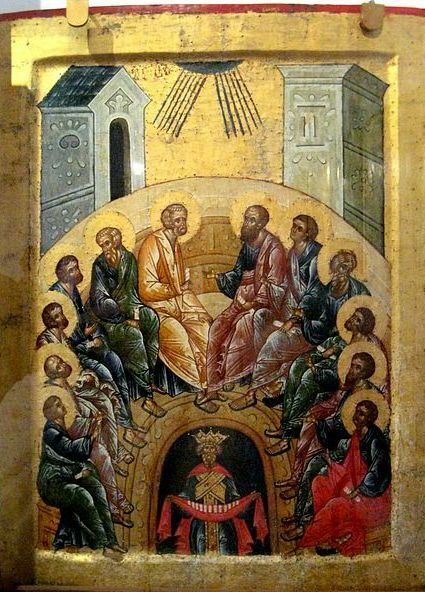 According to the icon the crux of Pentecost is this: the advent and presence of the Holy Spirit in the Church and via the Church in the world. How does the icon portray this? At the very top we see a small semi-circle with twelve rays coming out of it. These rays of light settle on the twelve apostles and depict the descent of the Holy Spirit. Twelve apostles? Weren’t there only eleven, as Judas was not with them anymore? Yes, that’s right. The twelfth person is Paul here, seated in the middle at the right hand side opposite to gold-robed Peter. Viewed historically he was certainly not there, as his unexpected conversion was to take place only later. But as an important pillar of the Church and the proclamation of the gospel to the peoples of the earth he takes in a prominent place in the circle of the apostles. The twelve apostles together represent the Church here. They are sitting in a semi-circle that symbolizes their unity and harmony. The semi-circle is open at the front, so that the viewer is included in the circle of the Church while being drawn into its unity. The faces of the apostles are deep in thought. Several are looking up. Two seem to look at us. Each apostle holds a scroll in one hand, while pointing up or making a frightened (the three in front at the left) or receiving gesture with the other. Paul especially holds his right hand wide open. In the middle, between Peter and Paul, we see an open spot. It is the place of honour, the seat of the teacher, around which all the others have gathered. It is reserved for Christ, who – though physically ascended into heaven – is the invisible but always present head of the Church. On many, mostly western, Pentecost icons Mary is seated in this central place. The Bible does indeed tell us that she was present at this gathering. But more than that she is depicted in the teacher’s seat as she is considered the exemplary human being, immaculate and without sin like Christ. Under and at the feet of the apostles we see a third semi-circle with an enigmatic crowned figure stepping out of it. This symbolic personage is Cosmos, representing the peoples of the world living in darkness. He is an old man, as he stands for a perishable world that is passing. He is surrounded by the blackness of sin and death. He holds a cloth, wherein twelve scrolls have been placed that symbolize the teaching of the apostles which will bring light to the dark world of the nations. According to Eastern-Orthodox thinking icons are not painted, but written. They are not regarded so much as art, but as a representation of the theology of the Church. Their content is therefore fixed. If one compares Pentecost icons, it will soon be evident that they all contain the same elements as the 15th-century icon above. These Pentecost icons make visible that the Holy Spirit empowers the Church to spread the light of the gospel to the farthest corners of the earth. With a power that cannot be stopped. With a power like the wind penetrating into the smallest cracks and holes and like flames spreading like wildfire. With a power that no-one had deemed possible, least of all this obscure bunch of followers of Jesus meeting in a backstreet of Jerusalem. Pentecost Icon, Kirillo-Belozersky Monastery, Russia, c. 1497.